Are Same Day Tooth Implants For Real? Especially among certain population groups, tooth loss is extremely common. Trauma injury, poor oral hygiene habits, and disease are the leading causes. Tooth loss is not just a cosmetic issue. When teeth are missing, the jawbone degrades. That puts other teeth at risk. Moreover, a missing tooth creates excess pressure on the other teeth. In cases like these, crowns and bridges are often an option, assuming the tooth is damaged as opposed to missing. These prosthodontic devices are relatively easy to make and fit. 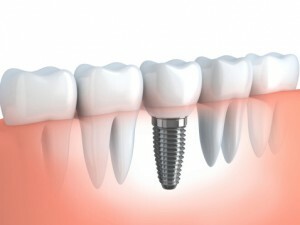 These same fast results may be available to implant patients as well, thanks to the advent of same day tooth implants. Your natural teeth did not appear overnight. In the same way, it takes implants time to grow. Nevertheless, same day tooth implants are possible. They are just not permanent. Dr. Stone builds implants from the ground up. He replaces the old tooth roots with titanium posts. This part of the procedure is usually the most complex. Many times, Dr. Stone must remove the existing tooth root. Furthermore, if your jaw lacks the bone mass to support the post, Dr. Stone may graft bone from other parts of the body or use . Next, natural bone grows around the post and solidifies it. This natural process is called osseointegration. Very soon, the titanium screw will be indistinguishable from a natural tooth root. Dr. Stone places an abutment on the top of the post, just above the gum line. Patients who want same day tooth implants can leave with temporary crowns (the visible part of the tooth) attached to the abutments. A few weeks later, when osseointegration is complete and the posts are stable, Dr. Stone affixes permanent crowns. They look, feel, and act like natural teeth. The laboratory carefully crafts the crowns so they match your other teeth, in terms of color, texture, and shape. Cleaning is simply a matter of brushing and flossing. In most cases, dental implants last a lifetime. There may even be no need to have them adjusted for size. Same day tooth implants stimulate bone growth. This process strengthens your natural teeth and serves as something of a facelift procedure. If you have weak or missing teeth, your face could almost literally collapse upon itself. Dental implants can be expensive. However, Dr. Stone is always upfront about the cost, there are no hidden fees, and we work with you in terms of payment arrangements. Same day tooth implants are the beginning of a permanent change for the better. After your permanent implants are in, it’s easy to see why this is one of the most exciting prosthodontic procedures to come along in years. To schedule your appointment with Dr. John Stone, reach out to Best Dental Associates right away. We’ve served the Ft. Lauderdale area since 1979.